Update 9 May 2014: The National Autistic Society has asked Hipp to remove its logo from materials for the event - full statement below. Health workers have alerted BFLG that Hipp is attempting to gain their contact details by promoting an event on 12 May 2014. In doing so it is violating World Health Assembly Resolutions on Conflicts of Interest and UNICEF Baby Friendly guidance. As well as offering a guest speaker from the National Autistic Society, Hipp is offering health workers the inducement of a 'hot fork buffet' to attend the event. 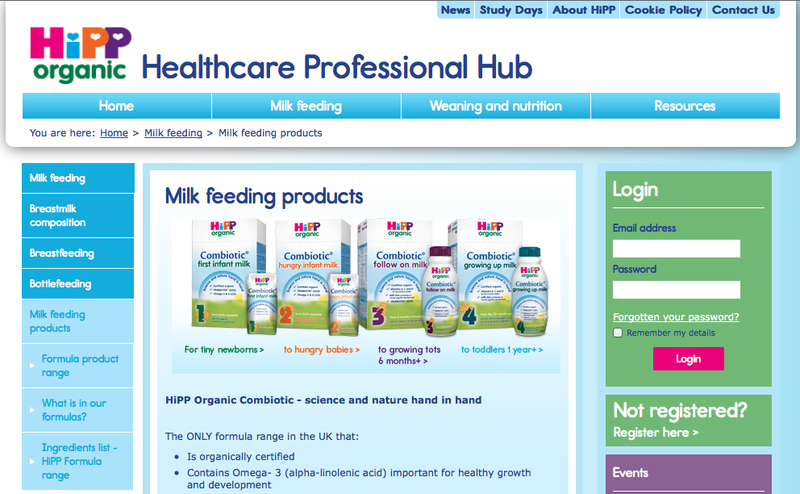 To register for the event, health workers have to first register with the Hipp Hub, where the company promotes its infant formula products with idealising claims. This provides the company with contact details for ongoing marketing activities. This is a strategy to bypass the restrictions many health facilities have in place on baby food companies making direct contact with health workers. Only allowing company representatives to meet with a designated expert member of staff or multidisciplinary committee is an essential step as much of the information produced by companies about their products is misleading. See the BFLG reports in the 'monitoring reports' section for examples of Hipp malpractice. Baby Milk Action has contacted the National Autistic Society for a comment on its involvement in Hipp's marketing strategy. As a charity, trustees should consider the possible harm to the charity's reputation from linking with commercial bodies. The message Hipp is circulating to encourage health workers to attend its event is shown below. “The NAS is committed to increase understanding and awareness of autism among all audiences and is very happy to take up invitations to do so by all legally constituted organisations complying with our ethical policies. Our participation in this event does not indicate any endorsement of the organisation running it.